Defense Secretary Jim Mattis told lawmakers he believes a chemical weapons attack occurred in Syria last weekend, but the Trump administration was still assessing conclusive evidence and deciding how to respond, including, whether to attack Syria with U.S. military strikes,as of Thursday. 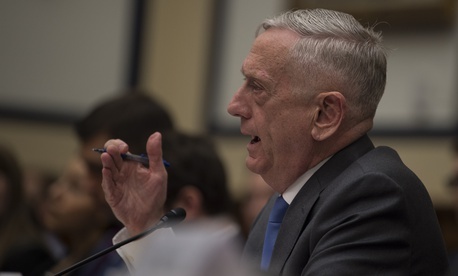 Mattis told the House Armed Services Committee on Thursday that the administration had practical concerns about collateral damage and getting entangled in a larger conflict. But he repeatedly emphasized that the use of chemical weapons in last weekend’s attack that killed at least 42 people could not go unanswered. Some international observers have speculated the attack could have been caused by industrial chlorine, rather than a weaponized nerve agent. By Thursday afternoon, NBC News reported the U.S. had confirmed the presence of a nerve agent and chlorine gas in blood and urine samples of the attack victims. “We’re looking for the actual evidence,” said Mattis, on Capitol Hill at the same time, noting that United Nations inspectors would arrive in the country “probably by the end of the week.” Those inspectors are working against the clock: The gases used dissipate over time, making it harder to confirm as days go by. But Mattis cautioned that even if they arrived as soon as possible, they wouldn’t be able to attribute the attack to anyone. “I get your drift,” she replied. French President Emmanuel Macron said Thursday morning his country had proof Bashar al-Assad’s regime had carried out the attack. Other allies have been more cautious, but the U.K. government said Thursday the international community must “take action” against Syria to deter future use of chemical weapons. After Trump met with the National Security Council Thursday afternoon, the White House said he would be speaking with both allies and had not yet reached a decision on how to respond.